A co-worker has a daughter that is graduating from college- a *huge* accomplishment! 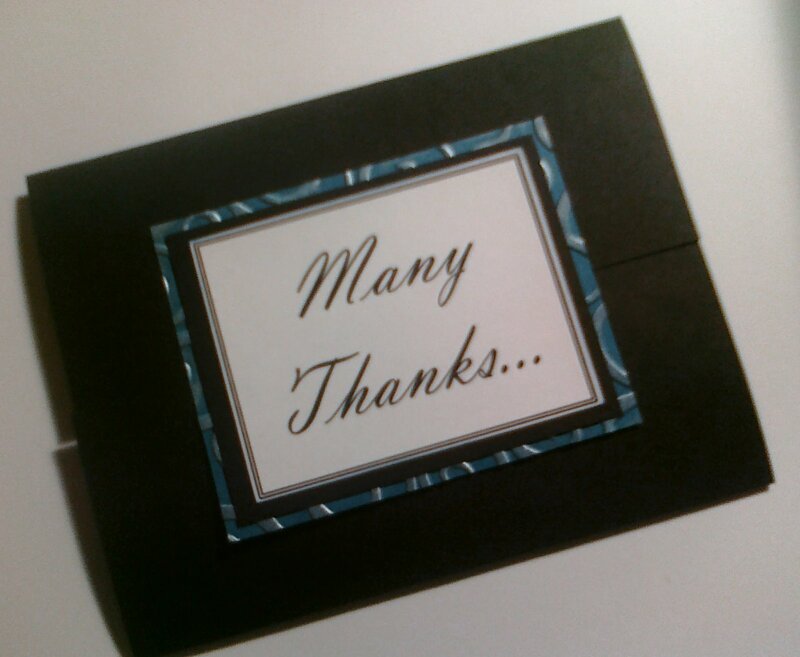 She asked me to make some thank you cards for her using her school colors of black, white, and teal. After thinking about, I knew that I wanted to do something for her that was a different- not just the same old regular card. That's when I decided that I would do a gatefold- one of my favorite cards to do! 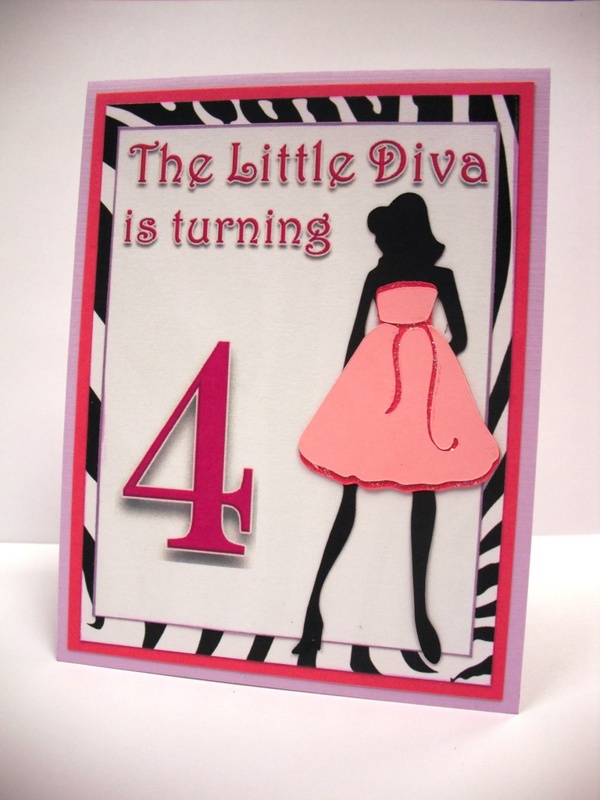 A friend of mine asked me to make invitations for her daughter's birthday and I was so honored! Her daughter is definitely one my favorite kids on the planet! When my friend told me that the colors were going to be pink and zebra-print (what else would you have for a little diva?!) I knew that the Forever Young Cricut cartridge was going to come in handy. 'Tis The Season-- Day 3! Awww! Today is the final day of the 'Tis The Season Blog Hop! Even though I'm a little sad that it's all over, I have had a BLAST seeing all of the wonderful projects that everyone has created! Special, special thanks to Iva for allowing me to participate! Her blog rocks! If you haven't had a chance to stop by, please do- www.ivarai.com ! 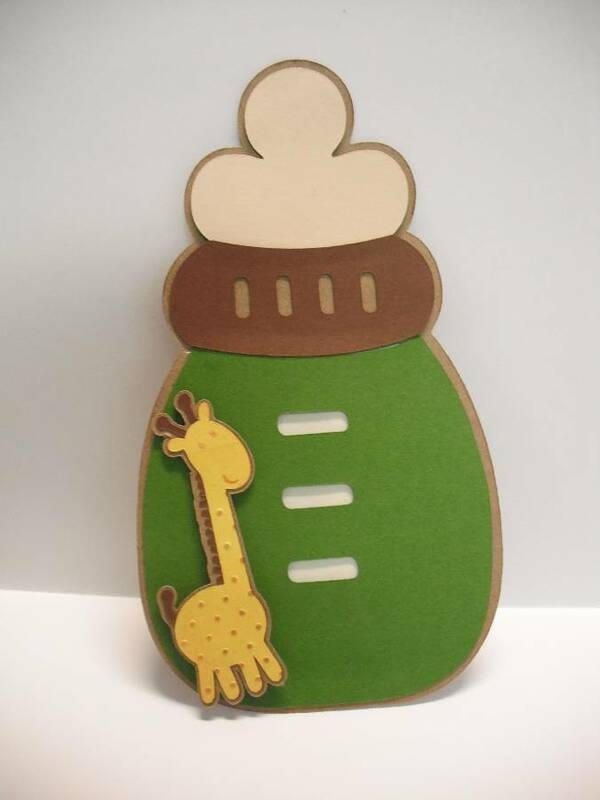 If you're following the hop you were treated to a super-cute card by Mary over at The Paper Salon! The base is an A2 sized in white. The bottom blue mat was cut at 5 3/8" (w) X 4 1/8" (h). The top white mat was cut at 5 1/8" (w) X 3 7/8" (h). The blue strip was originally cut at 5 1/2" (w) X 1" (h). 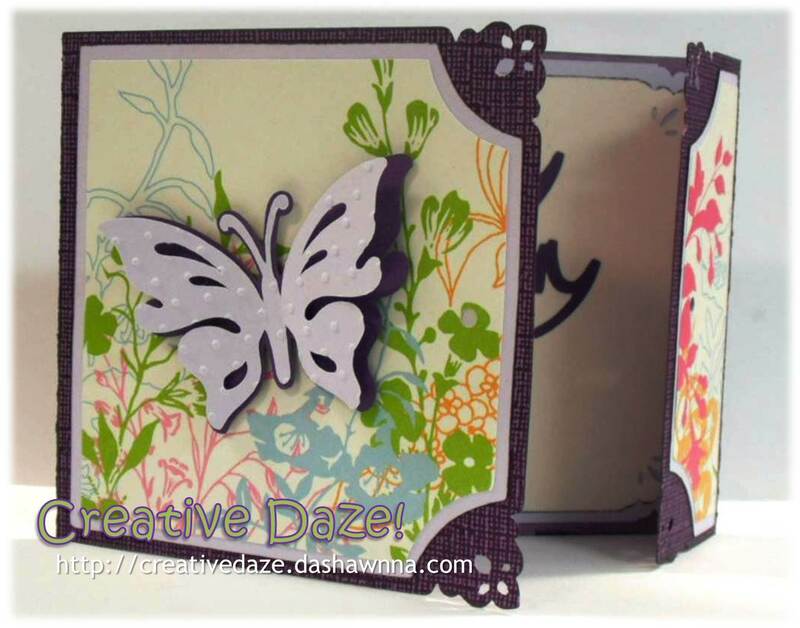 Then I ran the strip through my Cuttlebug in the D'vine Swirls folder. Using a metallic silver ink pad, I ran it lightly over the embossed swirls to bring them out. I adhered the strip to the white mat, trimmed off the excess, then adhered the white mat to the blue. At this point, the card front is just about complete, so I when ahead and adhered it to my white base. Once my bird was together, I used some mini pop-dots to adhere it to my card front. And then- taaa-daaa!! Peace of the Season is complete! Thanks everyone for stopping by!! I hope this isn't the last time you'll come visit!! 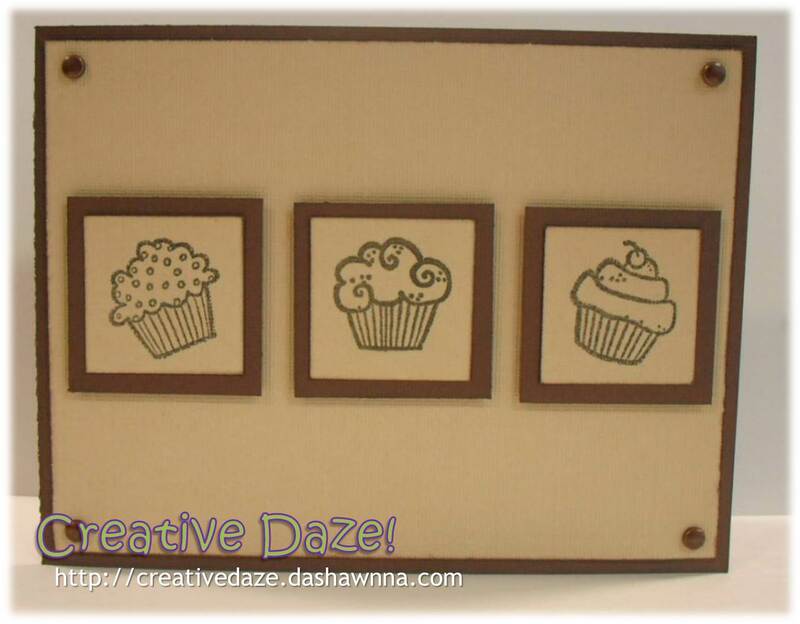 Everyone is always welcome to join me in my Create Daze!! Now I'll send you on over to Vickie! Happy Holidays everyone!! 'Tis The Season-- Day 2! Well, it's the second day of my very first bloghop- and I'm still super excited! Hopefully you were lead here after checking out Army Wife Learns the Cricut ! If not, you should join in on the blog-hopping holiday fun by starting at Iva Youngs' great blog - www.ivarai.com! 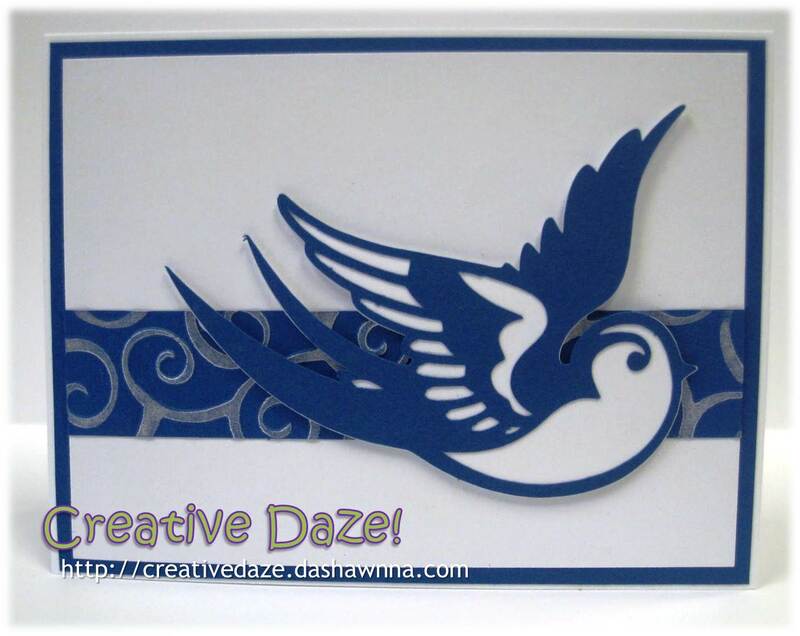 For this card I used the poinsettia cut from the Winter Woodland Cricut cart as my starting point. I think my favorite part of this card is embossing I did with my Cuttlebug and the Victoria embossing folder. To bring out the design, I lightly dragged a metallic gold inkpad across the surface. Normally I wouldn't think to use black on a Christmas card, but this particular creation kind of took on a life of it's own, and I think I like the finished product! Well thanks so much for stopping in again! I hope you'll be back one more time tomorrow!! Now, I'm going to send you on to Rita at http://www.ritahutchesoncobbs.blogspot.com/!! Have a great day and happy hopping!! 'Tis The Season! Blog Hop!! Happy Happy Holidays Everyone!! 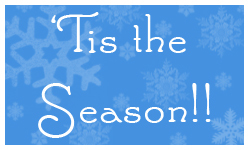 And thanks for joining in on the 'Tis The Season blog hop!! I hope you enjoyed the fabulous creations by the marvelous Molly over at Army Wife Learns the Cricut and that's how you got here!! If not, you should join in on the blog-hopping holiday fun by starting at Iva Youngs' great blog - www.ivarai.com! I started off with an A2 base in a nice deep holiday red. I generated the 'let it snow' sentiment on the computer and printed it on cardstock that was off-white. I cut the paper down to about 5 1/4" (w) X 4" (h). I placed a 6" strip of clear holiday packing tape I found at M's (for a dollar!) on the bottom of the off-white card. Wrap the ends of the tape around the card or cut them off- whatever is easiest! I cut a strip 1/2" (h) of the holiday red and placed is over the top border of the packing tape. Again, wrap the ends of the strip around the card or cut them off. Using my wonderful Cricut and my Winter Woodlands cart, I cut the 3rd snowflake out at 2" using the 'layers' feature. I affixed the snowflake on the off-white card using my zig-pen. I used my rockin' I-roc to glue on some bling. 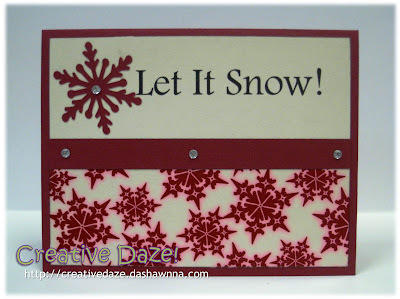 Finally I attached the finished off-white card to the front of the holiday red base and --viola!-- Holiday Flurries!! Well thanks so much for stopping in on the first day of the swap! I hope you'll be back tomorrow!! Now, I'm going to send you on to see the amazing and inspired work of Rita at http://www.ritahutchesoncobbs.blogspot.com/!! I got a request from a co-worker to create a nice card for her mother's birthday. While I wasn't quite sure what I was going to do initially, I did know that I wanted to use this nice rich red paper that I had. I coupled it with some designer paper (I forgot the manufacturer- opps!) and decided to create a 6X6 square card. Plenty of Crafting...Not Much Blogging! It's been a looonng time!! Or at least it feels that way since I have posted what's been going on in my creative daze! Lately, there have been lots and *lots* of projects to keep me busy and I haven't been that dedicated to blogging the results when I complete them. Truth be told, I even forget to snap pics of what I've done...ugh... But I am going to try and get back in the swing of things- and who knows- maybe I'll finally finish the tutorials I've been working on for-ev-er! Anyway, I wanted to share a Birthday Ambassador card with you guys that my wonderful co-worker Lidia made! Lidia is an ultra-talented crafter that I am so glad to call my Co-Ambassador! I am finally participating in my very first card swap and I am super-duper excited! The theme for the swap is 'Fall/Just Because'. I haven't ever done a fall card before, so this was a great challenge for me-- and a fun one!! Some days I wish I could 'retire' from my day job to craft full time!! ...like I said- I *wish* I could do that...! lol But reality isn't that bad, especially when I have great weeks like this one! It's official! Today I was dubbed the 'Birthday Ambassador' on my job! Yay me! lol And while I wish I could say that it's because everyone wants a card from lil' ole me- I think it's more because no one else wants the job! And since this now gives me an excuse to craft (like I actually need one! )- it's perfectly okay with me! With that being said, I found out that the next birthday on the calendar is THIS WEEK *&* it's a GUY! 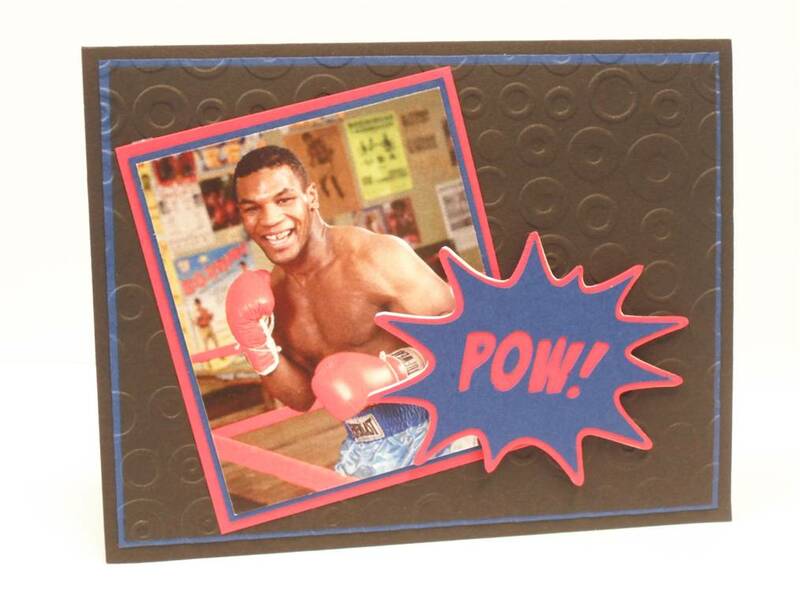 So that meant I had to come up with a masculine card quick! For someone who has only made 1 masculine card before, I was pretty much shaking in my boots! In the end, I decided to hunker down and knock it out! Here's what I came up with! We made it through the baby shower - and it was a great success! I was really pleased with the turn out, and so was the Mommy-to-be! Now that the main event is over, thank you cards were in order. So keeping with the giraffe theme- I created this set with a box to match! The inside features a phrase cut from Wild Card. I sure hope she likes it! The inside features a cut from the George cart. Oh- I almost forgot these little bags! My final contribution to my co-worker's baby shower are decorative bags that will be used around the room to anchor balloons and spruce up the buffet tables. 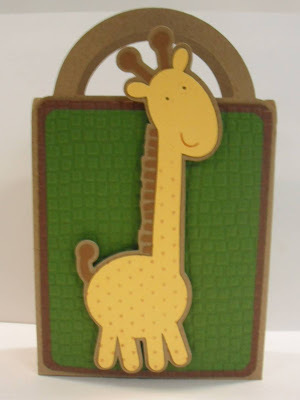 Once again, using the super-cute giraffe cut from New Arrival, to tie them in with the baby bottle invitations. The bag itself was cut from Plantin Schoolbook, which had truly got to be one of my favorite carts *ever*! There are so many hidden gems on it. So all in all, I was able to get a lot accomplished! Can't wait for the weekend to get here! Thanks for stopping by & have a great week! Ubber-cute invitations, anyone? LOL My co-worker is having a baby and we're giving her a shower in a couple of weeks, so we needed an invitation for the occasion! I starting thinking about what I could do, when it occurred to me that I hadn't done a 'spin-off of the flower pot' card in *forever*! So here's what I came up with! Back In My Crafting Groove! I have several projects that I've been neglecting, but now I can say that I am well on my way to 'clearing out my backlog'. 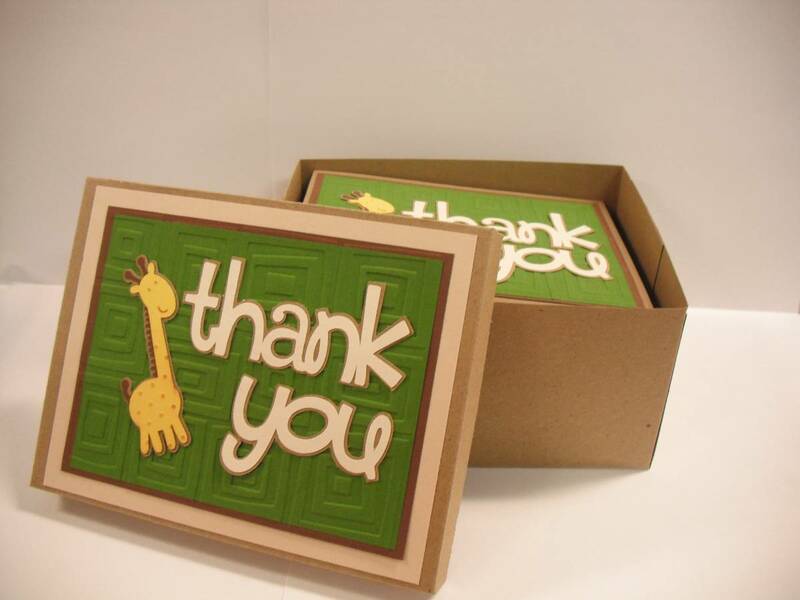 Thank you cards, birthday cards, graduation cards, invitations...the list goes on and on. So much to do- so little time- but soooo much fun to be had! Here are some pics of what I've accomplished so far! You guys know I love Joy Fold cards! I used the Green Stack from DCWV to pull this card together. The 1 1/2" Circle Punch from Fiskars was just what I needed to make the corresponding closure. After 9 verrrrry loooong months, I have finally been reunited with my Bugs and it feels so very *good*!! This move turned into a huge period of transition that I certainly wasn't expecting, and that- unfortunately- meant that my crafting had to be placed on the back burner until everything calmed down. But now (even though the transition isn't totally complete) I'm able to pull out my supplies and get back to doing something I love! When my co-workers suggested suggested getting together to craft- I jumped at the chance! What better way to get back in the groove than with a 'Crafty Saturday'? And let me tell you- we had a serious BLAST!! It was so much fun that we extended it into Sunday-- both days absolutely ROCKED!! We had such a good time that we decided to get together once a month, and I am already looking forward to the next one! 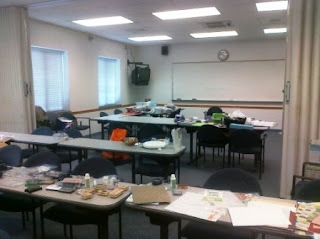 So here are a couple of pics from the Crafty Weekend! We took over two classrooms with our supplies and materials! Oh- and the snacks too!